Dr. Adam Mazzaferro was born and raised in Sonoma, California. While growing up, he and his twin brother Tony were avid motocross riders. Throughout Dr. Mazzaferro’s amateur motocross career he frequently visited chiropractors to keep his body functioning properly and to recover effectively from injuries. 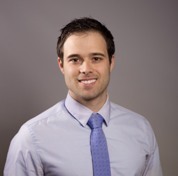 In 2011 Dr. Mazzaferro attended Brigham Young University-Idaho where he studied Exercise Physiology. Upon completing his undergraduate education he studied to become a Doctor of Chiropractic (DC) at the University of Western States in Portland, Oregon. While in the DC program he also completed a masters degree in Sports Medicine. As part of his final clinical training , Dr. Mazzaferro completed a 3 month clinical internship at the Veterans Affairs hospital in Spokane, Washington. In his spare time, Adam and his wife Melina enjoy hiking, camping, motocross and going to the park with their two dogs.